But we understand that it may be hard to navigate your way to the option that is the right fit for your needs. While both have their own advantages, today we are going to take a look at four of the benefits of having a liquid coating and why it might be the right fit for you. The first notable benefit for liquid coating is the fact that because the paint can be applied thinly so you need less of it, which in turn makes it an economic option. Less painting material means less money and an affordable option for you! Liquid coating also gives a vast variety of options in more ways than one. For starters, the liquid paint has a wide expanse of color choices, including both metallics and pearls, which can give your product the flair you’ve been looking for. Liquid also comes in various specialty coats. These specialty coats include glow-in-the-dark and teflon, which are ideal for specialty markets like military, medical, aerospace, and transportation needs. When painting with a liquid spray, the occurrence of film builds lowers. More film builds means a higher chance of rejected parts and a longer production time, which isn’t ideal for anyone. With consistent and effective coating, you and your team save a substantial amount of time and money. Sometimes, there will be sections of a piece that are not supposed to be painted and are taped off. Regular tape will not withstand the heat of the oven to keep a section paint-free on products that require baking. With liquid paint, because there is no need for an oven to set the paint, so sections can easily be marked off. In order to choose the path that’s best for your product, be sure to plan ahead and do your research to find the option that suits your specific need. The painting process is going to be varied for each product in order to fit the specific needs for each individual part. 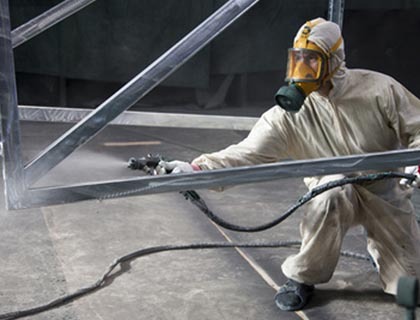 Sometimes liquid coating will be the right fit and sometimes powder coating will be the better choice—it’s all about the product. Production Paint Finishers is here to provide you with the top quality for your painting and coating needs and more. Give us a call at 937-448-2627 and we’ll help you determine which paint coating process will best fit your product, or request your quote here.